Designed to be an introduction to a group of children and new activities, the Penguin class is a fun and safe place for little people. With a parent there to share it with, children can meet other children and learn the beginnings of how to share the space and toys with others. 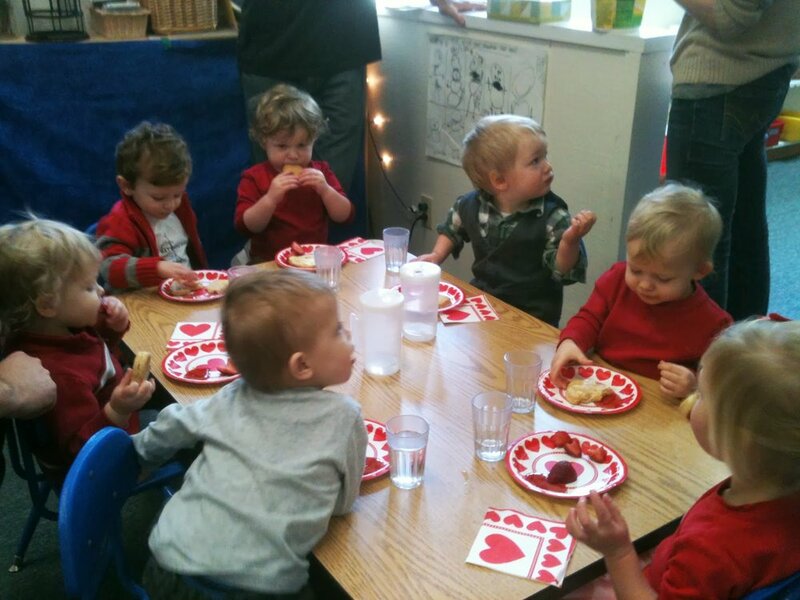 Parents take turns bringing a snack and delight in watching their toddlers "break bread" with other toddlers (and eat off each other's napkins if we don't watch out!). The day is set up with a variety of activities that encourage both large and small muscle development, which grow and change with the class as it grows and changes. These activities include the slide, rocking boat, tunnel, and large foam shapes for climbing and jumping off; peg boards, puzzles and sorting toys; blocks, cars, Duplos and a dollhouse; play dough, a texture table, and water play; and open-ended exploration of art materials. Children learn the simple structure of the day, which includes Choice Time, Toys Away, Snack, Outside Play, and Circle Time. In Circle, children learn fun songs and finger plays, activities to do at home with their parents, and the basics of how to listen and respond in a group setting. The main objective of this class is for children to discover that school and other children are fun and safe.